Audio: Starlene Interviewed Me About GAPS! 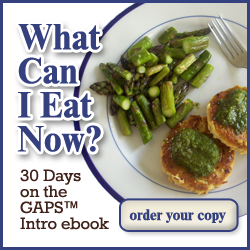 Starlene of GAPS Diet Journey has an ongoing blog talk radio show where she interviews people who have been doing the GAPS diet for at least six months. She’s even interviewed Dr. Natasha Campbell-McBride, herself! Starlene and I talked about about our family’s experience of the GAPS diet, and we got into discussing gluten and celiac as well, of course! If the audio doesn’t load, listen here. Survey for a Camp for Kids with Life-Threatening Allergies!